The all-new Jeep Wrangler brings Eastland drivers the comfort and capability they’ve come to trust from a Jeep. 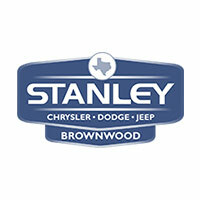 Prized for its rugged attitude and off-road performance you are sure to be impressed at Stanley Chrysler Dodge Jeep Ram Brownwood. Why Choose the Jeep Wrangler? Steel Bumpers protect you when the roads get rough. Tow hooks for pulling you out of whatever mess you find yourself in. 2000 pound towing capacity so you can bring your gear to The Heart of Texas. Still not sure which Wrangler option is right for you? See how the Jeep Wrangler stacks up against the competition like the Toyota 4Runner and the Subaru Outback, then contact us at Stanley Chrysler Dodge Jeep Ram Brownwood for a test drive.